An earthquake measuring 6.6 MW on the moment magnitude scale struck Iburi Subprefecture in southern Hokkaido, Japan, on 6 September 2018 at 3:08 a.m. Japan Standard Time. The earthquake's epicenter was near Tomakomai and occurred at a depth of 35.0 kilometres (21.7 mi). The Japan Meteorological Agency (JMA) registered a magnitude of 6.7 Mj and a maximum intensity of 7 on the shindo scale. Shaking from the earthquake was felt strongly in Hokkaido and Aomori Prefecture, and shaking was felt as far away as the Kantō region. The earthquake disrupted electrical service throughout Hokkaido, leaving 5.3 million residents without power. Forty-one people were confirmed dead and six hundred and ninety-one were injured. The event is officially known as Heisei san-jū-nen Hokkaidō Iburi tōbu jishin (平成30年北海道胆振東部地震, "Hokkaido Eastern Iburi Earthquake of Heisei 30"). The central area of Hokkaido where the earthquake was centered is prone to earthquakes despite not being located on any plate boundary. According to a survey conducted by the Ministry of Education, Culture, Sports, Science and Technology, there are several active seismic zones in the central part of Hokkaido, including the Furano and Ishikari fault zones. Studies have shown that earthquakes occurred in 1910, 1974, 1981, 1982, and 2000 in the region. Among them, the 7.1 Mj 1982 earthquake off the coast of Urakawa was the largest earthquake in the history of the region. The earthquake caused casualties and damage in Tomakomai and Sapporo. There are many volcanoes located near the earthquake's epicenter. The volcanoes distributed pumicite throughout the area which was later covered with a layer of heavier soil. The volcanic material is theorized to have caused landslides after being inundated during heavy rains due to its slippery nature. The wet pumice and the soil on top of it slid away after the shear forces of the earthquake ruptured the strata, causing the landslides that led to most of the casualties of the earthquake. On 21 February 2019, a magnitude 5.7 MW aftershock struck 10 km north of the epicenter of the main earthquake. This has been the strongest recorded aftershock of the earthquake. No major damage was reported, but there were small disruptions to rail systems such as the Hokkaido Shinkansen and the Sapporo Municipal Subway. In total four people, from Sapporo, Tomakomai and Noboribetsu, got injured and a avalanche was triggered in the town of Atsuma. Overall, damage in Hokkaido was estimated to be at least 367.5 billion yen. The earthquake crippled multiple industries and public facilities in the region. The earthquake cut power to all 2.95 million households in Hokkaido. This was because the Hokkaido Electric Power Company's coal-fired power plant in Atsuma was heavily damaged by fires that broke out during the earthquake. The damage to the plant caused an imbalance in the supply and demand of electricity throughout Hokkaido; this resulted in the blackout. By 6:30 p.m. JST on the day of the earthquake, power was restored to 340,000 households in Hokkaido. Hospitals were forced to function on emergency backup power, due to the blackout. Many hospitals had to turn away emergency patients because of the outages. All flights to New Chitose Airport were cancelled on the day of the quake. NHK World-Japan announced the airport resumed business at 11:00 a.m. JST the day after the quake. All public transport, including rail, subway, and bus services was shut down in Hokkaido due to the loss of electricity and damages. The earthquake caused many roads in Hokkaido to become impassable. Some roads were blocked by debris from landslides, others were destroyed by soil liquefaction as far away from the epicenter as Kiyota-ku, Sapporo. Near the earthquake's epicenter in Atsuma, emergency services could not take emergency calls after the quake due to the heavy damage. The blackout had a severe impact on the farming and fishing industries in Hokkaido. The prefecture provides half of Japan's raw milk, but without power for refrigeration or operating the milking equipment, the cows could not be milked and the product was wasted. Other produce, such as onions and potatoes, could not be kept cool or shipped away due to the closure of the rail network. As a result, an estimated 13.6 billion yen worth of perishable goods had to be discarded. The tourism industry in Hokkaido was hit hard by the immediate effects of the earthquake including delays and cancellations caused by the quakes' impact to transportation infrastructure; moreover, perceptions of the area as being dangerous due to aftershocks and general fear of earthquakes caused a decrease in tourism to the area. The total impact of the earthquake was estimated to cost the tourism industry approximately 35.6 billion yen as of October 2018. The earthquake was the first to have ever reached a maximum level of 7 on the Japan Meteorological Agency seismic intensity scale, or Shindo scale, in Hokkaido and the sixth in Japan since the system was put in place in 1949. There were 41 confirmed deaths resulting from the earthquake. 691 people were reported to be injured, 17 of which were reported to be serious cases. Thirty-six of the deaths were in Atsuma. The region was inundated by Typhoon Jebi, the strongest typhoon to hit Japan in a quarter of a century, the day before the earthquake struck. The earthquake triggered landslides in the wet soil the typhoon left behind which killed multiple people. Prime Minister Shinzō Abe holding a meeting in response to the earthquake. Prime Minister Shinzō Abe announced that 25,000 members of the Japan Self-Defense Forces would be deployed to Hokkaido to assist in disaster relief efforts. Also, he announced that he would temporarily suspend his campaign to be re-elected as President of the Liberal Democratic Party. His competitor, Shigeru Ishiba, also postponed some campaign activities. Abe visited Sapporo and Atsuma three days after the earthquake. He met with local political leaders and residents who were living at temporary shelters. After his visit, the prime minister announced that the government would allocate 540 million yen from reserves to aid in Hokkaido's recovery. The Japan national football team cancelled a friendly match scheduled for 7 September against Chile in the Sapporo Dome. The team sent their condolences to the victims of the earthquake. Rescue teams from Aomori Prefecture and Tokyo traveled to Hokkaido by the Seikan ferry to assist in the relief efforts. Nintendo announced that it would postpone its Nintendo Direct series release in light of the disaster. Facebook activated its safety check in response to the earthquake. Emperor Akihito and Empress Michiko visited Atsuma on 15 November to get in touch with the victims of the earthquake and landslides. Akihito also surveyed the area impacted by the landslides. Landslides (brown) can be seen throughout an aerial photograph of northern Atsuma taken after the earthquake. South Korean President Moon Jae-in, in response to typhoons and the earthquake, sent a Twitter message to Shinzō Abe on the sixth of September stating: "I express my condolences to the victims of the Kansai typhoon and the Hokkaido earthquake, and I wish comfort to those who have lost their families or were injured." He also voiced that Japan seems like they cope well with the various disasters that have plagued the country in 2018. @moonriver365 (6 September 2018). "일본 국민과 아베 신조" (Tweet) – via Twitter. ^ "平成 30 年北海道胆振東部地震の評価" (PDF) (in Japanese). Earthquake Research Promotion Headquarters Earthquake Investigation Committee. Retrieved 7 September 2018. ^ "Earthquake Information (Earthquake and Seismic Intensity Information) Issued at 21:26 JST 21 Feb 2019". Japan Meteorological Agency. 21 February 2019. Retrieved 22 February 2019. ^ a b c 平成30年北海道胆振東部地震による被害及び消防機関等の対応状況(第31報) (PDF) (in Japanese). Fire and Disaster Management Agency. 5 October 2018. Retrieved 3 December 2018. ^ "M 6.6 – 27km E of Tomakomai, Japan". United States Geological Survey. Retrieved 6 September 2018. ^ "M 6.6 – 27km E of Tomakomai, Japan: Did You Feel It?". United States Geological Survey. Retrieved 6 September 2018. ^ "震度データベース検索 （地震別検索結果）" [Seismic intensity database search (search results by earthquake)] (in Japanese). Japan Meteorological Agency. Retrieved 3 December 2018. ^ "The Earthquake off Urakawa (M 7.1), March 21, 1982" (PDF) (in Japanese). Hokkaido University. Retrieved 3 December 2018. ^ Normile, Dennis (11 September 2018). "Slippery volcanic soils blamed for deadly landslides during Hokkaido earthquake". Retrieved 3 December 2018. 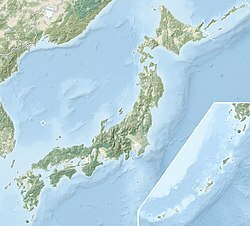 ^ "No major damage reported after magnitude 5.8 earthquake hits Hokkaido's Iburi region". The Japan Times. 21 February 2019. Retrieved 22 February 2019. ^ "Hokkaido assesses damage from M5.8 quake- News - NHK WORLD - English". NHK WORLD. Retrieved 22 February 2019. ^ a b c "Damage from deadly Hokkaido quake estimated at over 367.5 billion yen". Mainichi Shimbun. 4 October 2018. Retrieved 21 December 2018. ^ "設備および停電等の状況について". Hokkaido Electric Power Company. ^ "記者会見発言要旨（9月6日16時現在" (PDF). Hokkaido Electric Power Company. ^ "設備および停電等の状況について（9月7日3時現在）" (PDF). Hokkaido Electric Power Company. ^ "設備および停電等の状況について（9月7日9時現在）" (PDF). Hokkaido Electric Power Company. ^ "設備および停電等の状況について（9月7日12時現在）" (PDF). Hokkaido Electric Power Company. ^ "設備および停電等の状況について". Hokkaido Electric Power Company. Archived from the original on 7 September 2018. ^ a b "Hokkaido quake: Landslides bury homes, power cut to millions". The Asahi Shimbun. Retrieved 6 September 2018. ^ "Quake paralyzes public transport in Hokkaido". NHK World-Japan. Retrieved 6 September 2018. ^ "ライフラインの状況（9月6日18:30時点）". Prime Minister's Official Residence (Japan). Retrieved 6 September 2018. ^ "Breaking News at 11:00". NHK World-Japan. Retrieved 7 September 2018. ^ "住宅倒壊などの情報 北海道 厚真町". NHK. Retrieved 6 September 2018. ^ "北海道管内で地震による通行止めを実施しています" [We are carrying out a road closure due to an earthquake within Hokkaido]. East Nippon Expressway Company. 6 September 2018. Archived from the original on 6 September 2018. Retrieved 3 December 2018. ^ "Farmers, fishers struggling after Hokkaido quake". NHK World-Japan. Retrieved 7 September 2018. ^ "厚真町は震度７　北海道内で史上初の観測　気象庁". Asahi Shimbun (in Japanese). Retrieved 7 September 2018. ^ 北海道胆振地方中東部を震源とする地震について (in Japanese). 日本首相官邸. 6 September 2018. Archived from the original on 6 September 2018. Retrieved 6 September 2018. ^ Staff, Our Foreign (6 September 2018). "Hokkaido earthquake: Eight dead as landslides and power outages hit northern Japan". The Telegraph. The Daily Telegraph. Retrieved 6 September 2018. ^ Kaori Kaneko, Chang-Ran Kim. "Powerful quake paralyses Hokkaido in latest disaster to hit Japan". Reuters. Retrieved 6 September 2018. ^ "Japan PM Abe visits quake-hit Hokkaido as death toll rises to 42". South China Morning Post. 9 September 2018. Retrieved 3 December 2018. ^ "Japan vs. Chile cancelled after earthquake hits Sapporo". ESPN. 6 September 2018. Retrieved 6 September 2018. ^ "新幹線運休、青森からフェリーで対岸へ". Mainichi Shimbun. Retrieved 6 September 2018. ^ "東京消防庁 救助の専門部隊 北海道に派遣". NHK. Archived from the original on 6 September 2018. Retrieved 7 September 2018. ^ Martinez, Phillip (6 September 2018). "Nintendo Direct Postponed due to Hokkaido Earthquake". Newsweek. Retrieved 6 September 2018. ^ "The Earthquake in Hokkaido, Japan Crisis Response". Retrieved 6 September 2018. ^ "天皇皇后両陛下 北海道地震の被災者をお見舞い 厚真町" [The Emperor and Empress visit the victims of the Hokkaido Earthquake in Atsuma]. NHK. 15 November 2018. Archived from the original on 19 November 2018. Retrieved 9 December 2018. Wikimedia Commons has media related to 2018 Hokkaido Eastern Iburi earthquake. "About the Hokkaido Iburi Earthquake from the Prime Minister of Japan and His Cabinet" (in Japanese).